Georgia Governor's Mansion Ballroom — Patricia McLean Interiors, Inc.
Former Georgia Governor Sonny Perdue and First Lady Mary Perdue commissioned Patricia McLean Interiors to redecorate the ballroom after damage from a fire. The ballroom measures 80 feet in length, with a cozy dining-room setting at one end. The one window is the only light source. The "blonde" palette was proposed to bring light to the space and complement the existing terrazzo floor, which the First Lady wholeheartedly embraced. The custom-designed, hand-carved wooden cornice for the window is inspired by the beautiful, carved gilt wood fruit motif lozenge on the antique mirror. The drapery, swags and cascades were inspired by a visit Patricia enjoyed at The White House. The silk fabric, passementarie and matching tiebacks are from Lee Jofa. Patricia commissioned an artist to paint the strie stripe design for the walls. 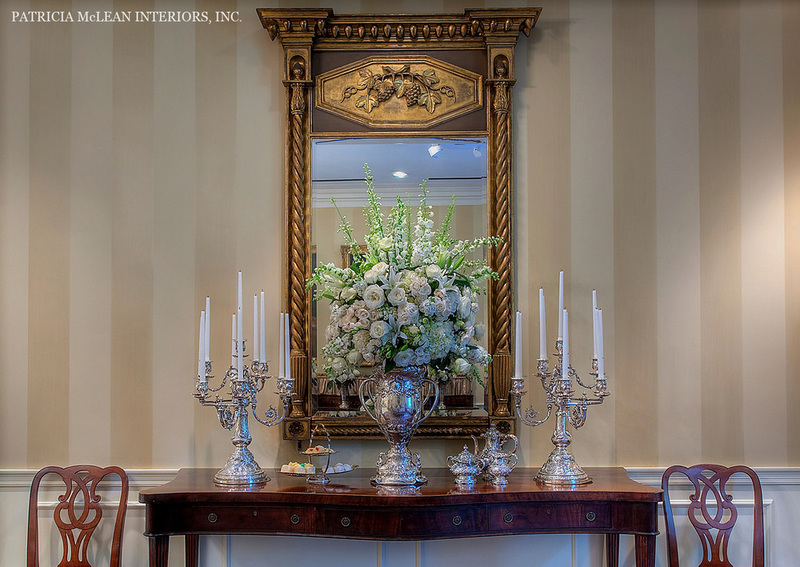 An air of stateliness is underscored by the antique silver on display from the USS Georgia and an antique English portrait, one of the finest in the Mansion's collection. The antique knife boxes stand guard over the room almost as sculpture. The table is set for a luncheon with flowers in abundance and the china complete with the Great Seal of the State of Georgia. ©2019 PATRICIA McLEAN INTERIORS, INC.